Bradford Street, Mount Lawley, Perth, Australia. statistical model known as autoregression is utilized to model the historical times aeries and make the prediction. application, due to its inherent randomness in nature. the appropriate model(s) for prediction and forecasting. and wavelet orthogonal projection denoising method. to evaluate the performance of proposed filters. 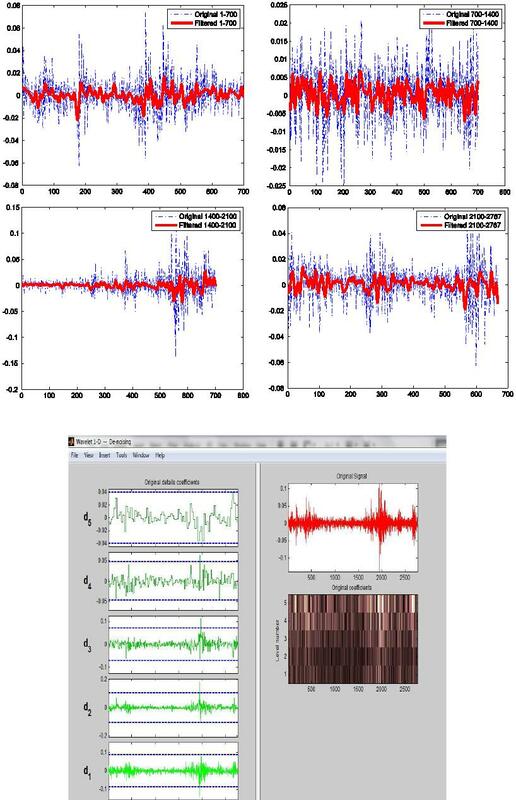 cial time series is illustrated in Figure 1.
curacy in both time domain and frequency spectrum. all a, b, Ψ() has the unit energy. the approximate entropy (ApEn)  is also introduced. value of standard deviation of the time series). Figure 1. Original and filtered times series (FBF). Fgure 2. Approximate and details of times series. Figure 3. Original and filtered times series (Wavelet). original signal (ﬁt rate (r) is too low, 0 < r < 22%). 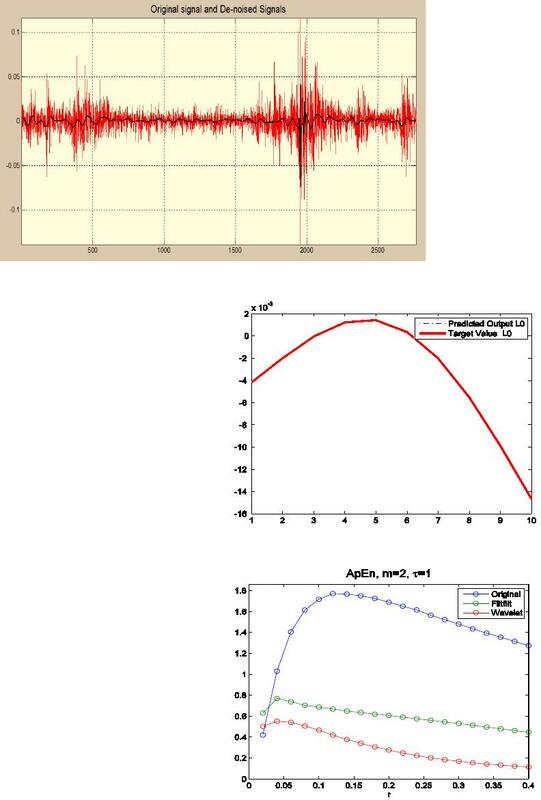 using the ﬁltered time series by FBF or wavelet. FBF to conduct the model training and prediction. Figure 4. Predicted output and target value (1). Figure 5. ApEn value of original and filtered signal. days. So I define the prediction period is 10 days. 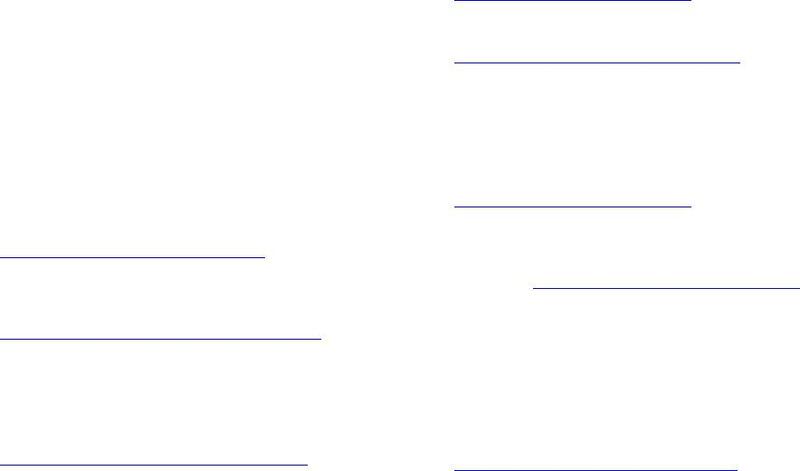 matching, as shown in Figure 4.
cisely matched to testing records. are 0.982 and MSE 1.81e - 08.
the predicted data and testing data is matched precisely. The related p-values are 0.915 and MSE 4.03e−09. Figure 6. 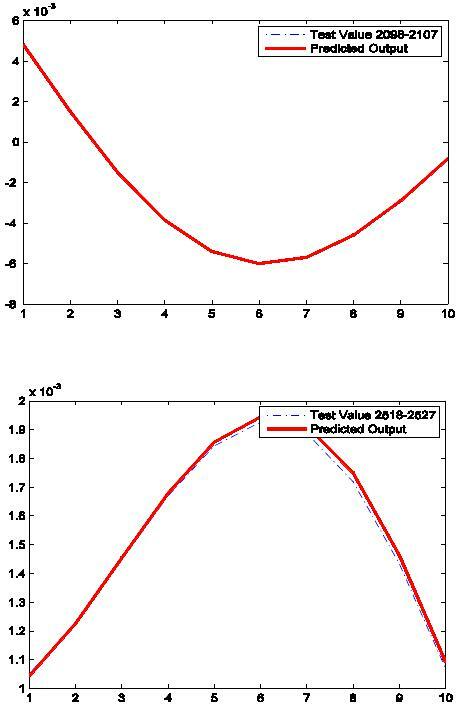 Predicted output and target value (2). Figure 7. Predicted output and target value (3). and related performance are excellent. needed to conduct the analysis folio optimization. Royal Society of London, Vol. 226, 1927, pp. 267-298. Wiley & Sons, Inc., New York, 2010. Processing, Vol. 44, No. 4, 1996, pp. 988-992. Industrial and Applied Mathematics, Philadelphia, 1992. Vol. 11, 1989, pp. 674-693.
the United States of America, Vol. 88, No. 6, 1991, pp.